Although Jane has worked in many media, she now exclusively makes sculptures. Jane’s work is an exploration of the transitions between planes and how they define a form. Beth has been studying pottery for 40 years and continues to teach her techniques around the Northeast Ohio Region. Grace is an accomplished jewerly designer who has her own complete line sold in boutiques nationally and resides in Cleveland, Ohio. Adrian teaches drawing and painting at the Cleveland School of the Arts and is a teaching fellow at the Cleveland Museum of Art. In addition, he is also the founder of Walton Avenue Atelier, a space committed to studying the practice of Classical methods in the visual arts. Susan Gallagher has been a ceramic artist for 45 years. She has also been an Ohio Arts Council Artist in Residence for ten years and is the former Director of the Ceramics Department at the Beck Center for the Arts. 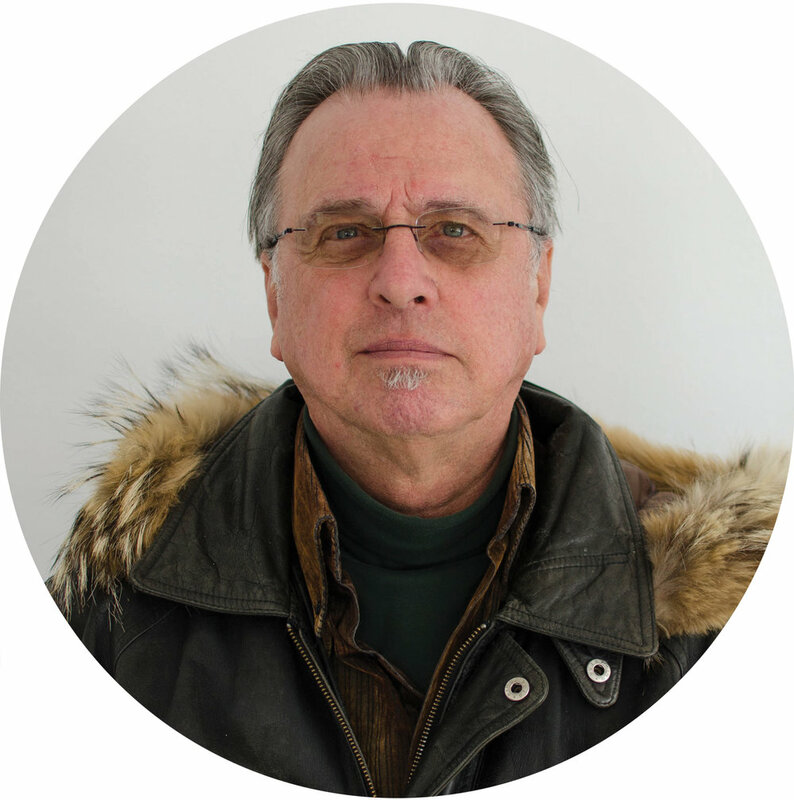 Lou’s experience in the illustration and design field spans five decades working as an illustrator and art director. He is also still active in the art community as a charter member of the Northern Ohio’s Illustrator Society. Amy has taught numerous workshops throughout the US, was a visiting artist at The Pottery Workshop in Jingdezhen, China and a resident artist at The Archie Bray Foundation. Her work is in several collections and is shown nationally. George is best known for his monumental paintings and is an internationally collected artist. He is the recipient of numerous awards including the National Endowment For The Arts Individual Artist Fellowship and four Ohio Arts Council Grants. Dino’s paintings have been awarded numerous competitive prizes in local, regional and national exhibitions. His portraits, landscapes and still life compositions are also included in private collections internationally. In addition to teaching at Orange Art Center Massaroni also teaches at the Cuyahoga Valley Art Center. Linda has been painting for as long as she can remember. As a child, she was inspired by the detailed wildlife artwork of Robert Bateman, Carl Brenders, and others. Primarily self-taught, she pursues a realistic approach to drawing and painting, creating detail in meticulous layers. She is currently visual arts faculty at the Willoughby Fine Arts Association, Beck Center, and Orange Art Center. Stephanie has taught elementary art in the Cleveland and East Cleveland public schools. In recent years, she has exhibited her work at in many galleries around the area. She has participated in numerous sales and art festivals including Art by the Falls in Chagrin Falls and Cain Park Arts Festival in Cleveland Heights. AD Peters has been teaching at the OAC for 35 years and has his paintings collected internationally by institutions such as the Cleveland Museum of Art, Progressive, and the Cleveland Clinic. Annie has taught art at Grand Valley High School in Orwell, OH for more than 40 years. While there she was awarded Teacher of the Year three times, and the Ruritans Outstanding Teacher Award. Peters has also exhibited her work in museums, including the Cleveland Museum of Art and the Southern Ohio Museum, as well as national and regional shows. Bob has over 40 years of experience teaching at the university level: Cooper School of Art, the University of Akron, the Cleveland Institute of Art, Edinboro University of Pennsylvania, and Youngstown State University. He recently retired to dedicate full time to his own painting in his art studio in the Shore Cultural Center in Euclid. Debra Rosen is an accomplished designer, fabricator, and educator with over twenty years of experience creating jewelry art. Rosen has taught at the Orange Art Center since 2004, and focuses on giving her students a fundamental foundation upon which to develop their own visual language. John A Sargent III is a native Clevelander and professional artist since 1988 graduating with his MFA in painting from Ohio State in 1988. He has had the privilege of teaching at The Albright Knox Museum in Buffalo. He is a board member of the Artist Archives of the Western Reserve and serves on the Gallery Committee at Valley Arts Center. A ceramic artist and instructor with more than 25 years of experience, Andrea Serafino freely shares her techniques for wheel throwing, hand-building and clay sculpture with her students. Mandy Spisak is an enamelist and art instructor from Cleveland, Ohio. She received her BFA from the Cleveland Institute of Art with a focus on painting and enameling. She is the owner of Retro Revival, an enameling and stained glass studio and gallery located in Valley View, Ohio. The act of creating something with your own two hands was something that was exhilarating and inspirational to Jenn. Still actively exhibiting her work, Szalkowski’s work has been featured in various local art shows at several shops and galleries throughout Northeast Ohio. In addition to being Cleveland Scene Magazine’s Visual Arts Editor from 2014 to 2017, he has been teaching kids cartooning classes since 2013 in various institutions around the region. His own artwork has been featured in more than 100 group exhibitions, as well as several solo shows, and is represented locally by Tregoning & Company. Guy-Vincent is an internationally exhibited and collected interdisciplinary artist. His art practice has investigated a great variety of modes of expression including: traditional media, concept-based performative endeavors, moving images and photography. His artwork is represented in numerous public and private collections. Marlene retired from a 30 year health care career in 2012 and completed a BFA in Painting and Drawing from the University of Akron’s Myers School of Art in 2016. Marlene shows her work in regional and university exhibits and engages in her community through teaching. Daniel has maintained a studio for the past 30 years alongside with the experience of being an illustrator, graphic designer, muralist and fine art painter. His work is in many private and corporate collections. Allison has taught art in Philadelphia for 16 years and recently moved back to the Cleveland area where she grew up. During her years in Philadelphia, Allison was involved with many arts initiatives both with the schools and local communities bringing murals and programs to the students. Allison loves working with drawing, textiles, printing and various crafts, sometimes combining the techniques for interesting mixed media projects.